Coral bleaching has struck the world's southernmost barrier reef, in the Lord Howe Island marine park – a pristine crescent-shaped islet in the Pacific Ocean off the coast of Australia. While damage to coral caused by climate change in the country is usually linked to the Great Barrier Reef up north in the tropics, this is the first time that heat stress has led to coral bleaching this far south. Researchers say extreme temperatures experienced over the Australian summer have seen bleaching of up to 92 percent on some of Lord Howe Island's reefs. 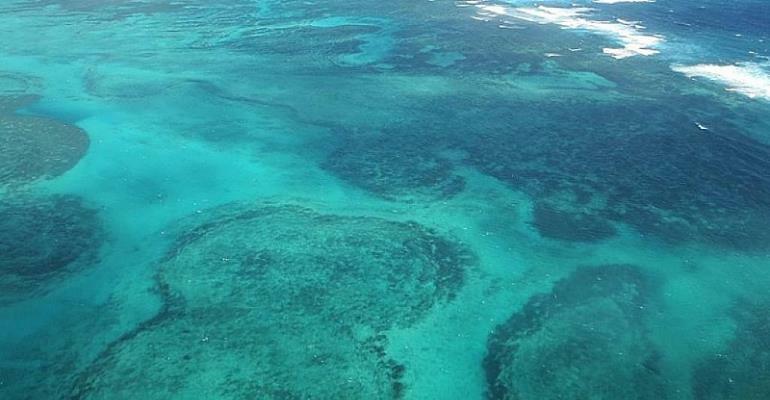 Five out of the six sites surveyed suffered some form of coral bleaching, says Tess Moriarty, a PhD candidate from the University of Newcastle, who was among those who spent several weeks in March – the peak month of the year for coral bleaching – documenting reef damage. With waters a full degree Celsius warmer this summer than usual, Moriarty had been inspecting coral disease on the reefs back in November. She returned to Lord Howe last month to follow up. Most of the damage occurred in the lagoon reefs closer to shore, while some of the corals further out, on the reef's far edge, remained healthy. “The waters closer to shore aren't mixing as much and they're not getting fresh saltwater intakes flushing through, cooling the temperatures and bringing in more nutrients,” Moriarty says. As part of the survey, the teams – who included researchers from the University of New South Wales, James Cook University and Australia's National Oceanic and Atmospheric Administration – would take coral samples and assess their ability to photosynthesise. “Corals are an animal, but they have a symbiotic relationship with the algae,” Moriarty explains. “The algae are what feeds the coral and give it its colour, so without the algae the corals are colourless, or bleached, and you can see through to the white skeleton. This isn't the first time Lord Howe Island marine park, one of the most isolated ecosystems on the planet, has experienced coral bleaching. On two previous occasions, the corals were able to recover. Researchers say there's good reason to believe the reefs will bounce back once again. They plan to return to Lord Howe in late April to carry out follow-up surveys. “Hopefully we'll see more recovery than mortality,” Moriarty says, adding the island is sometimes referred to as the “western Pacific Galapagos Islands” thanks to the high number of endemic and unique species that call it home.